There are challenges, and there are challenges. For example, not speaking the language is a challenge. Learning a new sport while trying to overcome a phobia that I’ve had since childhood is an entirely different challenge. Day 1: We caught a ride to the main kite beach (Santa Marianita) with the owner of the business from whom we’ve rented a harness. The ride to the beach is pretty sketchy—the highway is being repaved in several spots, so it’s about two parts paved road to one part dirt, and there’s no real transition between the two (Ecuador being a less litigious country than our own, there seem to be fewer attempts to make accommodations for you). With the hills that you have to traverse and sparse population, the beach town feels remote—like a rare jewel that has yet to be discovered. The beach itself is lined with several sun-bleached bamboo and straw cabanas that offer kite lessons, kite rentals, and food—the things that a kiteboarder really needs. 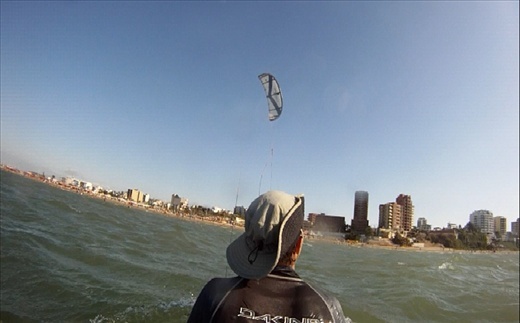 For my first lesson, we focused on keeping the kite aloft and steady. Before this trip, I had practiced with a training kite, but a training kite is much smaller than the real thing, so it took some time to get used to the power of the larger kite. I tried to get into the surf, but the shorebreak is so strong at this beach that I quickly went into hyperventilation mode. Ugh. Day 2: Body dragging. Dear god, that sounds like something I shouldn’t be doing. Thankfully, I didn’t have to do it alone. This time, we stayed at the beach at our own hotel where the shorebreak is less forceful and I could feel a bit less freaked out by the waves. Since I was still feeling skittish by the water, David managed the kite while I dragged behind him. I was relieved to discover it was a lot of fun. In the kiting world, there’s something called “the walk of shame.” This is when you, as a newbie, don’t have the skill to kite upwind to return to your launch site, so you land the kite on the beach, and then return to the launch on foot while carrying the kite behind you. While I can see why this might seem shameful, I can think of something equally shameful. Such as not minding the high/low tide and losing the beach you need to walk on to return to the hotel. Yes, this happened to us and we were forced to leave the beach and walk through town—all while in full gear: helmet, life jacket, harness, and neoprene suits. Walking through town is not as direct a route, so it took twice as long, during which time we received many curious looks and several honks from passing taxis—because if anyone ever looked like they needed a taxi, it was surely us. Day 3: More bodydragging. Lots of fun. Day 4: As we’ve been so focused on my lessons, I’m insisting that David take a day to surf without me. So, for today, he will ride the waves while I brave the blowing sand within a little makeshift cabana (a little covered structure on the beach). David tells me that there are two kinds of lessons that he used to teach: dinner lessons and dessert lessons. Most of the time, clients only wanted dessert so he skipped ahead to the fun part, but in so doing, they didn’t learn the basics involved in dinner; such as running the kite lines, attaching them to the kite, inflating the kite, launching and landing, etc. Given my skittishness, I am the perfect candidate to have dinner first. So far, I’ve learned all of those things, and I’ve even taken a nibble of my dessert course. However, I can see that my need to feel secure about everything will mean I’ll need several more lessons before I can truly devour the dessert. So, perhaps on my next trip I will be able to report that I rode the waves on my board. For now, I am quite content with what I’ve learned.